The Sultanate of Oman is a fantastic country to visit. My third trip to Oman has been absolutely wonderful. Aside from doing a 4x4 safari to Jebel Harim in the Musandam Peninsula, I revisited Muscat. It’s a city I wasn’t very fond of the first time I was there. I basically did a complete 180, which is why you should always give places you didn’t like a second chance. Muscat is a real pleasure with a lot to see and do. 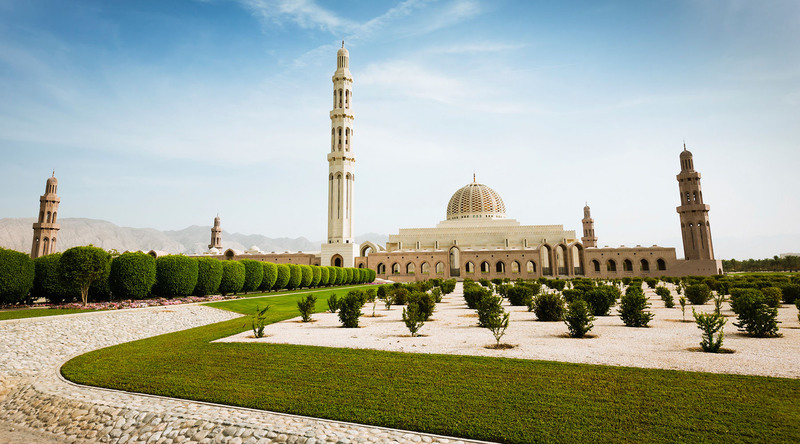 Here are five awesome things to do in Muscat, Oman! The Grand Mosque in Muscat is probably the city's top tourist destination. It’s a massive, beautiful mosque completed in 2002. It’s on the outskirts of the city and simply a taxi ride away. It’s worth noting that tourists are only allowed in from 9:00 to 11:00 a.m. If you arrive after 11:00 a.m. have no fear, you can still walk around the grounds and get some amazing photos and views of a real marvel. It’s reminiscent of the Grand Mosque in Abu Dhabi, just on a smaller scale and a darker color. The AL Bustan Palace is a Ritz-Carlton property and has hosted some of the biggest VIPs on Earth in the last few decades, including Michael Jackson and Bill Clinton. It’s a six-star property and it literally resembles a palace in size, scale, and outright beauty. Walking into the lobby is an awesome experience. You’ll look up and down, side to side, then repeat over and over again! It’s that cool. It takes a few minutes to get your bearings with the size and opulence of the lobby. The Al Bustan Palace is stunning, it really is. I didn’t actually stay there as I was staying onboard the Azamara Journey but in Oman anyone can go into hotels without paying - unlike Dubai and other Gulf States. However, that’s where I would have stayed for sure and I’ve been told the prices aren’t that bad either, especially in the off-season. The Souk is located right in the center of the Corniche in the old town, right by the port and the taxi stand. It’s a great place to walk around and do some shopping if that’s your thing. It’s not my thing, but I like the frenetic energy of the hustle and bustle in the Souk. I hired a private driver that I found in town, near where the tourist buses are. My driver, Talal, spoke excellent English and was very kind, helpful and honest. I felt very comfortable with him and we ended up hiring him for two full days. First, he took us around Old Muscat. This is where many Omanis live; it’s a bit older and is the location of the Sultan’s Palace and many ministry buildings. It’s a nice place to walk around and see some forts that are only there for decoration. It’s a nice place but new Muscat is tops for me. The beach is the center of much of the social life in Muscat. Omani’s drive up and down the strip (where the Starbucks is) to show off a bit and take in the views. Families will picnic on the beach and young people will hang out at night. The beach itself is pretty nice - not Southern California nice, but pretty nice! Wadi Shab was the highlight of my trip to Oman, let along Muscat. I had actually never heard of it. My driver Talal recommended it for the second day. I had asked him what was the best thing to do in the country as we had a full open second day in Muscat. He was right - it was fantastic! Wadi Shab is a 90-minute or so drive from Muscat along the coast and into the mountains. Then it’s a solid hour walk after a short dinghy ride to cross an inlet. The walk is hot and there is nowhere to get water or food, so bring your own. It’s also a tough walk and older people should definitely be very careful or avoid. Once inside the cave, you can actually climb a rope up a small waterfall and then jump off 20-foot cliffs. It’s absolutely fantastic and a real thrill. It’s probably the coolest thing I’ve done in the Middle East in terms of nature. I highly recommend it. These five awesome things to do in Muscat, Oman will keep you busy for a few days without question. You will fall in love with Muscat and Oman in general. It has quickly moved right to the top of the list of Middle Eastern countries for me. I look forward to staring at the desert Bedouin camps next time I’m out this way! Azamara will call on Muscat, Oman twice in 2017 and twice in 2018. Browse those voyages here.